This might be a half-baked idea, but what if music, like fashion, is seasonal? There might very well be bands and songs whose place in the pantheon of sound lies with a certain level of temperature and humidity, specific to time and place. Let’s imagine that there are intrinsic parallels between music and atmosphere. Now imagine what those parallels might be in concrete terms. Winter is cold, dry, and bleak – fitting for driving drums and guitars wailing in defiance of barometric oppression. Fall is colorful, but mournful with the onset of winter’s wailing – best for music with a certain sense of desperation and impending doom. Spring, conversely, is a time for newness, innovation, experimentation, and optimism. That leaves summertime, when the living is easy. In summer a person can be fairly sure they won’t die of exposure or starve in the street, (assuming you don’t live in a desert and are somewhat employable) and, therefore, the soundtrack of that season must match that sense of easy-goingness. In tangible, metaphoric terms, summer music must resemble a lazy river or a convertible driving at night with the top down. If we use these parameters, half-baked and flawed as they are, then Skiptracing, the first album by Mild High Club, is summer music for sure. 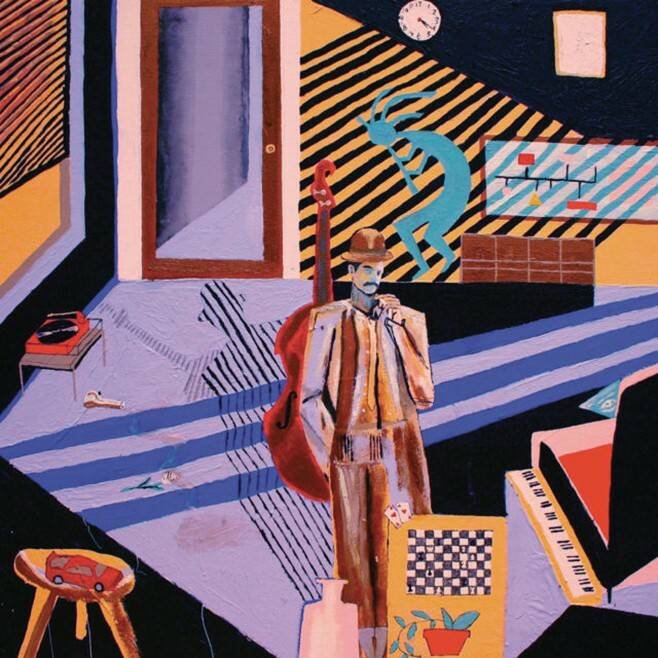 Invented by a Mr. Alexander Brettin, Mild High Club embodies summer music through a constant hum of mellow, dare I say mild grooves, befitting of a musician from Los Angeles, where it’s always summer. Brettin’s elevated monotone voice comes through every track with a slight bit of distortion and a casual haze, like a meditation tape – you hear it, but you don’t really need to listen to it to get pleasure. The instrument quiver is pretty typical for the stoner rock genre, of which Mild High Club definitely is a part of: vintage guitars, keyboard, snare drum kit. They’re played like timid waves on a sea, with a constant sound, but sometimes, one instrument will perk up above the others for a time before settling back into the current. The waters do get a little choppy in the middle of the album, right around the song, “Kokopelli.” For those that don’t know, the Kokopelli is a musical God that lives in the caves and cliffs of the American Southwest. It has been embraced by the new-age movement and other hippie types that self-classify as, “Spiritual, but not religious.” Because of the Kokopelli’s ties to power crystals and drum circles, it’s an easy target for scorn. Though Skiptracing does a good job of walking very close to the camp of hipster-nostalgia-nonsense without entering, on the “Kokopelli” track Brettin dips into full-on ironic hipster detachment. Though the album doesn’t quite get as bad as a 23-year-old wearing an “awesome” unicorn sweater and riding a hoverboard through Williamsburg, the second half of the album feels a little too cool for school: the guitar solos feel like they are being played with an excessive amount of whammy bar, the tracks don’t blend together as well, it feels like there’s a reaching for some sort of vintage sound that has been long dead. Comparing music to seasons might be a stretch of conceptual thinking, and one that might never have been theorized had the author not been sitting shirtless in front of a window unit while eggs fry on the sidewalk below, but Skiptracing has an element of melt to it. It’s music that, for the most part, doesn’t require a lot of effort to derive pleasure from, and even children and parents can get something out of it when the listener is too lazy to turn down the speakers. Courtesy of Stones Throw Records, Skiptracing can be found wherever music lives these days, starting on August 26th.